In the winter of 2008/9 in response to the Israeli attack on Gaza Az Theatre (London) and Theatre for Everybody (Gaza) launched GAZA DRAMA LONG TERM, a 10-year collaboration. The second stage of this project is GAZA BREATHING SPACE, a programme of drama sessions working with the young people who have been most disturbed by the impact of organised armed conflict. This work takes place at the Rehabilitation Centres in Deir Al Balah and Jabalya refugee camps. 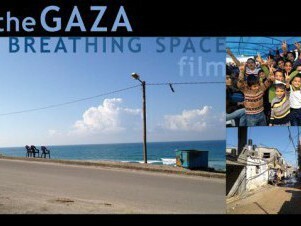 THE GAZA BREATHING SPACE FILM is a record of this work and the personal and professional journey undertaken by Az Director, Jonathan Chadwick, to Gaza in November 2011 to meet and talk to participants, families and workers involved. It offers a unique insight into the work with young people being undertaken by Gaza artists and an intimate portrait of life, resilience and resistance behind the blockade. “Wonderful, special film. Must have been good to hear the laughs, of recognition, of relief…The children enacting adult behaviour, their curiosity about tunnels reflecting our own amazement at the fact that there are over eight hundred of them, or turning the treacherous territory they negotiate every day into a slippery, surreal floor on the stage.” Anthony Meyer, Artist.